Southern justice is torn to shreds during the jury deliberations on a race trial set to make history. Based on a true event. Lineup and Details for A Sacred Thing. 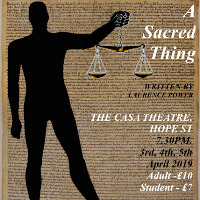 Secret Key Productions presents A Sacred Thing, the debut performance of a thought-provoking piece written by author, Laurence Power. Southern justice is torn to shreds during the jury deliberations on a race trial set to make history. Doors open at 7:00 PM with a view to a 7:30 PM start.